It’s your special event, so celebrate somewhere that holds a special place in your heart. Let us help make your anniversary memorable. With two lovely restaurants and a number of beautiful private rooms to choose from, we can assist with planning your anniversary celebration; you can be confident your party will be perfect, right down to the last tiny detail. With many families (including especially now our many previous Balbirnie brides and grooms!) wishing to return to Balbirnie over the years, we would be simply delighted to assist with your special event. We cannot even begin to convey how special it has been over so many years to see these celebratory occasions taking place in the house on a daily basis. So very special. And long may we continue. In an overall planning context, as always, we say that we start with a blank canvas. We hope that our suggestions are helpful, and if you, as our client, have any special requests or suggestions, then please do let us know. We will always be absolutely delighted to consider incorporating any and all special requests which we consider we can physically deliver, and we certainly do not mind being put to the test! Over the years we have seen some quite incredible parties here at Balbirnie, and here’s to those wonderful celebrations ahead! We are justifiably proud of the enviable reputation we have for dining at Balbirnie. We are always pleased to discuss individual ideas and develop special menus for your own celebration. The content of your chosen menu will depend on how many guests you have attending your dinner/lunch. With other comparable dining destinations across the country in mind, our fixed price inclusive menus offer absolutely wonderful value. A NOTE REGARDING OUR IN-HOUSE CHEF’S SPECIALITIES! Simply outstanding value @ £48.50 per person! For more information download our Anniversary Package information here. 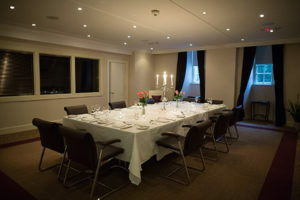 In addition to offering 30 – 40 guest private booking capability in our Balbirnie Bistro, we are now able to convert a section of Balbirnie’s existing Business Centre, into a day or evening Private Dining Room, within which we can offer a version of our lovely Bistro menu. For up to 30 guests. We also highlight that the Bistro Deluxe chairs are wonderfully comfortable. Magnificent chrome framed Boss design with Andrew Muirhead soft Scottish chocolate leather. The room itself offers scope for linen-clothed rectangular tables, and as we are deluxe – crisp linen napkins of course!!! The Courtyard @ Balbirnie House – a totally unique dining facility, for private and corporate special events. The Courtyard design was inspired in 2016, by a visit to Denmark, specifically Copenhagen’s StreetFood market. 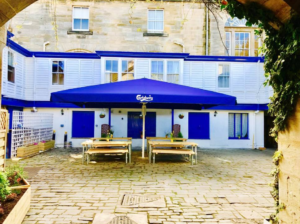 This Scandinavian-inspired area was created for Balbirnie, in conjunction with Carlsberg, and provides you and your guests with a truly unique outdoor dining experience! Brand new for 2017, The Courtyard setup allows 4 tables each for up to 8 guests, with gigantic parasol, overhead heaters, sheepskin rugs, and Carlsberg blankets as required. Whilst equipped with overhead heaters, guests are advised to arrive dressed for outdoor dining. On the coldest winter days, please bring, hats, gloves, and coats. The Courtyard is equipped with overhead fairy lights, incredibly romantic at night. The area also has a sound dock, with low level in-house playlist. Simply outstanding value for both Pop-Up Bistro & The Courtyard @ £35.00 per person!